Nanni’s Alfa Romeo is a Gas! It is not often we get a car named after one of the members of the Grand Prix Drivers Club but at the Paris Show last October Alfa Romeo showed a concept car called the Tecno-Montecarlo Nanni Galli, a tribute to one of our favourite members, Nanni Galli. Nanni was one of a team of young Italian drivers who was given his introduction to major international motor racing by Alfa Corse at Portell0 particularly with the Tipo 33. Since October the car has been tested at the private race track Alfa have at Portello and Fulvio Ballabio did the driving. 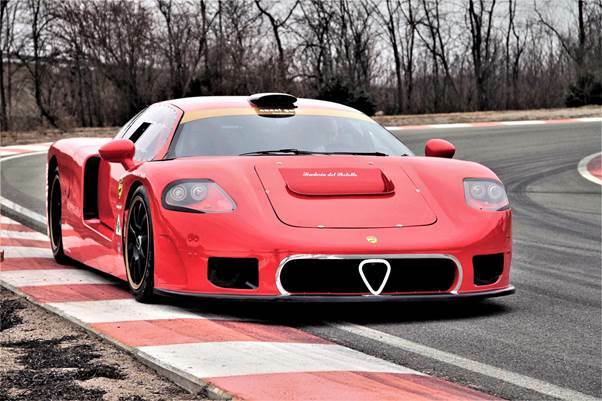 The Nanni Galli V8 Ecoracing as it is called, is something completely new as it is the first GT designed by Alfa to use LPG ( Liquefied petroleum gas) in a 503 bhp V8 engine. So, why the link to Tecno, who became famous for their karts and then their Formula 3 cars before moving into Formula 1? Well, it came about when Gianfranco Pederzani ,who founded Tecno with his late brother Luciano along with Nanni and Fulvio Ballabio ,began to discuss the possibility of reintroducing the Tecno name and they used the word Ecoracing to underline the use of LPG. The carbon chassis and bodywork was designed by Sami Vatanen in Finland and was built in Italy by Bellasi Compositi in Novara. As can be seen from the photo the car has adopted the shape of the former Alfa Tipo 33 that was so successful in the hands of Nanni Galli and Teodoro Zecolli in the past. We hope to write more about this new development and plans for its future in a month’s time at the Imola event being organised by Giancarlo Minardi.